If we could eat only one comfort food for the rest of our lives, it would be—hands down—macaroni and cheese. So we’re going on a road trip to find the most epic bowls of mac and cheese in the country. Bring extra napkins. It’s easy to see why this Birmingham joint is famous for its mac and cheese—the Three Little Pigs is laced with prosciutto and local bacon, then topped with pulled pork and fried onions. Equal parts ooey and gooey. Get it with a slice of homemade meatloaf. The secret to this famous Phoenix mac and cheese? It’s baked in a huge sheet pan, then cut into squares. Meet the Mac Attack Burger, sold at the concessions stand at the home field of the University of Arkansas at Fayetteville. Bet it’s pretty hard to focus on the game when you’re eating this guy. The state of California has a bunch of serious contenders, but the macaroni and drunken Spanish goat cheese at this San Francisco spot is tangy, bubbly perfection. We’re just gonna say it: The creamy lobster mac and cheese is a national treasure. You can’t go wrong with over-the-top creations like chicken-and-waffle mac, BBQ mac and buffalo mac (above). This joint on Rehoboth Beach has plenty of meaty, cheesy options, but we were über impressed with this vegan number smothered with walnut chili, Daiya cheese and bread crumbs. OK, when we hear “Mexican restaurant,” we don’t automatically think “killer mac and cheese,” but this Queso Mac, with queso blanco, cotija, Oaxaca and Jack cheeses and sprinkled with homemade tortilla chips, is what dreams are made of. These soupy, satisfying noodles typically come as a side, but we think we’ll order four next time. Yep, those are mac-and-cheese pancakes. With syrup. BRB, booking a flight to Honolulu. Shh, there’s bacon hidden under those baked tomatoes. Lots of bacon. Admit it—your life needs more smoked Gouda. This Chicago hot spot’s creamy mac and cheese is coming to the rescue. This mac and cheese defies the laws of physics. How can it be both saucy and crunchy at the same time? Mind blown. Oooh, this combo of Gouda, aged cheddar, Mornay sauce and bread crumbs is dangerous. Pair this cheesy bowl of goodness with a pulled pork sandwich. Trust us. Nope, you’re not hallucinating. That’s mac and cheese stuffed inside a grilled cheese sandwich. Psst, gluten-free friends: You can get this creamy deliciousness made with GF noodles. This bread-crumb-topped masterpiece gets extra bonus points because you can order it with crab cakes. Yep, it’s officially possible to hide an entire serving of veggies in a bowl of decadent mac and cheese. Word of mouth has made Brian Perrone’s baked mac legendary. And even though it’s bursting with flavor, it’s made with only one type of cheese: cheddar. Mac and cheese and fried chicken…has a more perfect union ever been created? The fried chicken at this St. Louis soul food spot is great, but the baked mac and cheese is the unsung hero. Guys. You haven’t lived until you’ve eaten mac and cheese topped with crushed Doritos. You just haven’t. Spiral noodles, tangy sauce and panko bread crumbs? We’re in. 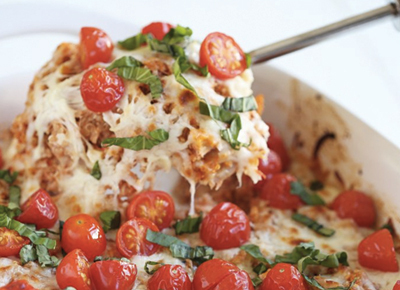 Fact: Everything is better in a skillet, and this super-saucy baked mac is no exception. With 19 varieties, we give you full permission to eat here three times a day for the rest of the week. One Philly cheesesteak mac and cheese, please. Oh, and a shrimp scampi mac, too. Oh hey, pulled-pork mac and cheese topped with piles and piles of gooey cheese. Pleasure to meet you. This renovated Texaco station serves up cavatappi pasta with Gruyère, Irish cheddar and Parmesan bread crumbs. Ask for green chiles on top. The mac and cheese competition in the Big Apple is stiff, but this Seattle-based cheese shop has melted the hearts of jaded Manhattanites. The creamy-and-crunchy macaroni au gratin, made with Jarlsberg, Grana Padano and white cheddar, is a statewide-hit. This restaurant has mostly Asian fare, but it serves up a surprisingly good mac and cheese, too. Try it with Sriracha drizzled on top. OK, this is mac and cheese at its fanciest: butter-poached Maine lobster, cognac reduction, chives and a blend of Brie and goat cheese. Yum. Eat this wonderfully gooey mac and cheese with a side of green chili corn-bread. This baked mac and cheese is made with a blend of white cheddar, Gruyère cheese and a rotating wild-card cheese that could be anything from goat to blue. We love living on the edge. You can’t go wrong with any of the mac and cheese concoctions at this Philly food truck (and recently opened brick-and-mortar shop). Try the Heart Attack Mac, with caramelized onions, bacon and potato chip panko bread crumbs. Seven words: Build your own mac and cheese bowls. We’ll take ours with bacon and buffalo chicken, please. This is the most award-winning mac and cheese in the country (whoa). Get yours with pulled pork, bacon, broccoli, sea scallops, shrimp, grilled chicken, short ribs…or get really adventurous and try all of the above. You know what? Macaroni and cheese isn’t decadent enough. Let’s batter it and deep-fry it. This cafeteria-style Memphis lunch joint serves way better mac and cheese than our high school did. This brilliant combo of Gruyère and cheddar baked in a skillet pan is our version of heaven. Grab a half pound of deliciousness from this country store for under $4. This delicious blend of goat Gouda, Asiago and Cacio de Roma creates the creamiest sauce we’ve ever tried. This Seattle Mediterranean spot has a build-your-own mac and cheese bar on Mondays. We’ll take ours with spicy harissa and lamb sausage, please. If there’s one state that knows its mac and cheese, it’s Wisconsin. And this Madison staple isn’t kidding around. It cooks its version on the stovetop, then bakes it with bread crumbs at the last minute for added crunch. 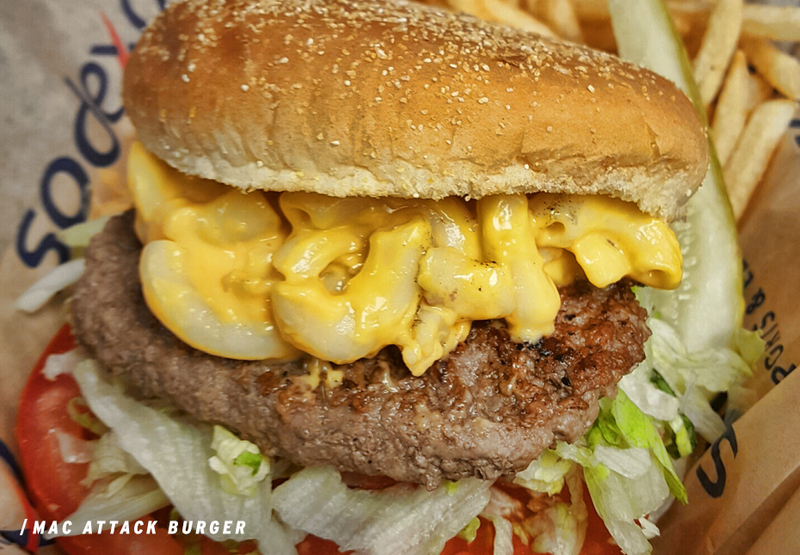 It’s called the epic mac and cheese for a reason—you can get it topped with grilled chicken and broccoli, a cheeseburger or brisket chili. Don’t worry, dear District of Columbia, we’d never forget you. Go on Mondays, when the mouthwatering mac is made with duck bacon.